A longer video that shows sights of the Yampa Valley, which is our home...plus our shop and some insights from a few people at Moots and what brought them to Steamboat in the first place. Filmed during our Spring run-off. Scottish street trials star Danny MacAskill has now become an official ambassador for the KTM FREERIDE E after showing an interest in the bike earlier this year. SLULU VOODOO -- "Skill Drill"
Practice makes perfect, and in this episode, Specialized-lululemon's Ally Stacher talks the importance of basic skills and bike handling. Now get out there and pick up those bottles! What would happen if we just STOPPED DRIVING? So a few km’s and a few climbs . . . . Looking for an honest evaluation on the various bottom bracket standards available? Pro mechanic Greg O'Keeffe offers his point of view in this special edition of the Art's Cyclery Ask a Mechanic series. A love for cycling is stronger than any injury. This video will show you that the handicapped riders can participate in any adrenaline sports! http://www.vintageelectricbikes.com was born in the heart of the Silicon Valley. This young bike company is the perfect mix of classic design aesthetic hard wired with modern electric technology. In this feature, eGarage explores how friends began their journey into a venture charged by passion, innovation and freedom. Specialized released its new COBL GOBL-R carbon fiber leaf spring suspension seatpost for dirt roads, cobbles, cyclocross, and cross-country mountain bike racing. Chris Riekert talks about the post and its cyclocross relevance. Perhaps best of all, this was all achieved on a budget of NZ$21,000. The Tiny House was constructed on his parents property, and will soon be moved to a friends property in Bethells Beach in Auckland. This modern tiny house is filled with treasures obtained over a lifetime of adventure, and may just be the ultimate bachelor pad. Chris Chance and finds out he's got big plans for bringing his iconic Fat City Cycles back to life. A mechanic's point of view in the Vuelta! In this episode, Mark and Chris explain the logic behind our metric of time saved over 40km. What to eat and drink, while riding, and how to eat and drink it, are questions that cyclists of all experience levels are faced with. Former Tour de France rider Daniel Lloyd gives his pro tips to get the most out of your riding. SLULU VOODOO -- "Pinning it"
So you signed up for your first race? Congratulations! While there are small differences from country to country on where to pin your number before you line up, the real voodoo is how to lock that sucker down. In this episode, Specialized-lululemon's, Carmen Small, demonstrates what a real, pro-pin job looks like. It all started on the bike. 40 years ago Specialized was born from humble beginnings complete with a handwritten catalog and parts delivered via bicycle. What started then is what keeps us looking forward today – providing all riders with real performance advantages. To celebrate 40 years of life on two wheels we’ve teamed up with an old friend. Mark DiNucci was one of the original Specialized frame designers and his bikes are still winning global recognition today. Together with Specialized, Mark has created an entirely new and exclusive 40th Anniversary Allez frame – in steel. Far from just a retro road bike, every tube, lug, and braze on has been completely reexamined through fresh eyes and carries the experience of our last 40 years of innovation. It’s a bike that carries all the inherent ride qualities of steel coupled with the type of modern technological advances that push it into an entirely new category. It’s the culmination of 40 years of bike building filtered down into the very best steel bike we’ve ever made. In a special nod to where it all began, the 40th Anniversary Allez frame is being built in the very factory that was responsible for the first Specialized Stumpjumper. Limited to just 74 frames worldwide, the 40th Anniversary Allez is more than just a bike. Included with every kit is a limited edition Merino wool sweater, winter and summer cycling caps, exclusive leather S-Works Toupe saddle with matching leather saddle bag, and matching leather bar wrap to top it all off. Each one of these extremely limited pieces was designed and constructed to the same high standard of quality as the frame itself and were conceived to both compliment and highlight this very special project. 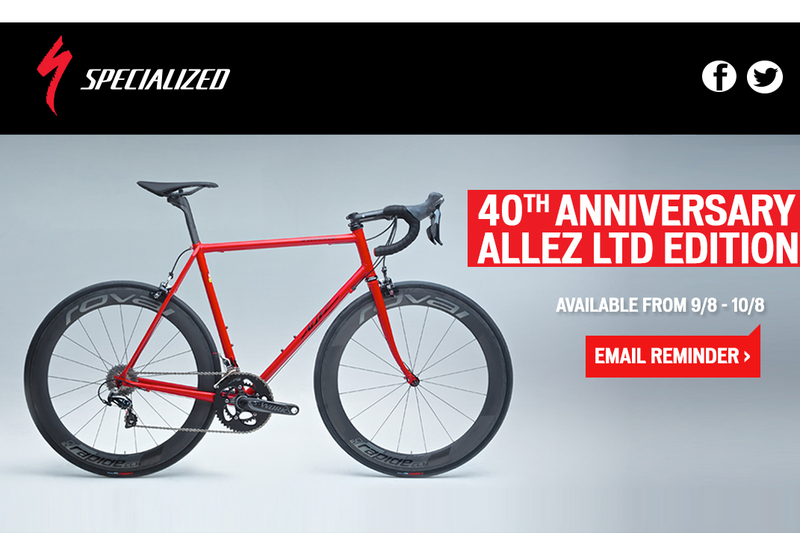 The 40th Anniversary Allez is a complete package that bridges the past and present of the Specialized brand. Additionally, with all proceeds earned from the sale being donated to World Bicycle Relief, it’s a perfect way to ensure the future of bikes continues to look stronger than ever. World Bicycle Relief is a nonprofit organization mobilizing people through the Power of Bicycles. They envision a world where distance is no longer a barrier to education, healthcare and economic opportunity. Compared to walking, bicycles increase carrying capacity and accessible travel distance while decreasing commute time. Since 2005, World Bicycle Relief has provided more than 195,000 specially designed, locally assembled Buffalo bicycles to disaster survivors, students, healthcare workers, and entrepreneurs. They’ve also trained more than 950 field mechanics to ensure access to qualified maintenance and spare parts. Through their Bicycles for Educational Empowerment Program (BEEP) WBR provides Buffalo bicycles to rural students (70% girls), teachers and school volunteers to improve access to education. A two-year study of their work found a 28% increase in attendance and 58% increase in academic performance for students with bikes. 69% of students reported feeling safer while commuting to school. Each bicycle represents a life-changing new beginning for students, families and communities. Through this exciting partnership, we hope to mobilize over 500 rural students with Buffalo bicycles to access education. Place your order now and join the movement. This is part 2 of my tour of Park Tool in St. Paul Minnesota. Watch how Specialized Racing helped Vincenzo Nibali become the first Italian to win the Tour de France since 1998.